Now, on the the Featured Friday Excitement!!! 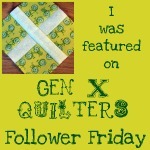 I am being featured at Gen X Quilters today!!! So exciting!!! Thank you Anne Marie for having me over at your blog. If you have never been to Gen X Quilters take a second and pop on over there. Anne Marie has some fabulous stuff going on!!! And while you are there, leave a comment about my witty and upbeat feature. (tee hee hee). I saw your interview early this morning - breakfast and blog hopping. Lovely children - I did not you shortened your hair due to fire - oh my! Looking forward to quilting with you and others.